Swords & Soldiers is a humorous and cartoon style real-time strategy created by Ronimo Games studio. Players control the actions of one of the three factions - the Vikings, Aztecs or cosmic marines, trying to conquer the opponent's castle and at the same time defend their own. 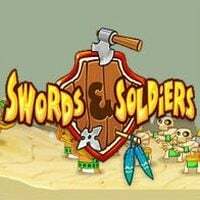 Swords & Soldiers is a 2D real-time strategy game developed by Ronimo Games, the producer of de Blob for PC. Although it does not feature overly complicated mechanics, the game encourages the player to think and carefully plan ahead. The game offers simple rules and lots of humour, both in the incredibly colourful visuals (resembling a comic book) as well as in the audio, which is full of various battle cries of the warriors we control. The gameplay in Swords & Soldiers boils down to conquering the enemy castle before he conquers ours (the strongholds are placed on the opposite sides of the map). To do so, we have to train units efficiently, gather resources, and use spells. Swords & Soldiers allows us to control three different factions, each having its own advantages and disadvantages. As each side also worships completely different deities, there are no repetitions in the spell arsenal. The playable nations are: the Vikings, the Aztecs, and Space Marines. Every faction is presented with a large dose of irony that is bound to keep the player smiling. The developers also implemented a multiplayer mode via split-screen. The production has no age restrictions.